“The Left Hand of Darkness” is widely regarded as being a classic work of Science Fiction. I think a lot of the praise it gets is well-deserved but I also found it a bit disappointing because it is a book that I ended up admiring more than actually liking. A large part of the book’s fame comes from the setting, a world named Winter which is entirely populated by genetically modified humans who are all androgynous and only take on male or female sexuality for a short period of time each year. Much of the story revolves around the main character Genly, an envoy from a distant space-faring civilisation on a First Contact mission, trying to understand the world he finds himself in and trying to adjust to a society without traditional gender roles. 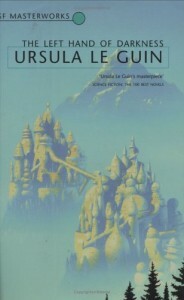 This premise would probably have felt more revolutionary when this book was published in the late sixties, the impact of it has been diluted a bit by later books using a similar premise (probably in many case inspired by Le Guin’s work), but I think the book still has plenty of interesting and thought-provoking things to say on the subject. I think this is the best bit of the world-building, but I was less impressed by some of the other aspects of it. A lot of time is spent describing the world of Winter and the two main civilisations on it but other than the inhabitants’ unusual gender I didn’t find the world to be all that interesting and at times it felt a bit lacking in depth, particularly when Genly moves to the excessively bureaucratic land of Orgoreyn whose society felt too simplistic to be entirely convincing. There are some interludes adding some historical and mythical information about the world, I thought these varied from interesting to slightly dull. One thing that does work well is showing how hostile and unforgiving a world the aptly-named Winter is and it’s probably no coincidence that the most compelling part of the book details an arduous journey across a glacier. We don’t get to see much of the civilisation which sent Genly on his mission and I think we could have benefited from seeing a bit more of them. Genly’s attitudes and way of viewing the world made him feel more like a character from 20th Century Earth rather than advanced spacefaring civilisation and I was never entirely clear whether this was meant to be a commentary on that civilisation not being quite as liberal and open-minded as they probably thought they were. If we could have seen some other characters from the same civilisation this might have helped show whether Genly is typical of them or whether he was just a poor choice who wasn’t well-suited for the job he is asked to doo. The way Genly’s mission is structured also seems contrived and unlikely, while I can see the logic behind sending a single unthreatening envoy to make First Contact rather than a large party it does seem unbelievable that he spends most of the time out of contact with the ship that brought him and that they didn’t at least send one envoy to each civilisation on the planet (unsurprisingly the fact that he landed initially in one civilisation rather than the other leads to some tension). The characterisation had some high points but was often a bit lacking. I thought there was one really fascinating character in the form of Estraven, the senior politician who is one of the few people on Winter to fully grasp how important Genly’s mission is. The interactions between Genly and Estraven are key to the book, both their initial misunderstanding as the differences between their cultures cause confusion and their eventual friendship as they are both forced to flee from those who see Genly’s mission as a threat. Unfortunately, while Genly and Estraven get plenty of character development we don’t seem to see enough of most of the supporting characters for them to really become interesting and as a result they end up feeling a bit bland by comparison. The book is fairly slow-paced for the most part as Genly wanders around Winter (slightly aimlessly at times) and it feels like the story only really kicks in during the last third of the book. By the end the story has become compelling, but it’s a pity that the book took so long to get to that stage. Ultimately it does make for a satisfying and thought-provoking plot but it does feel like the book could have added a bit more in the way of plot and characterisation without losing any of the elements that made it interesting. This is a book that I would recommend for its ideas and I think it does enough to deserve its status as a classic work of Science Fiction, but some other SF classics have done a better job of balancing ideas and plot.